There’s no arguing about who is the better quarterback. Each will reply that he or she is. It is not often that a brother and sister can have a friendly sibling rivalry about being a quarterback on a high school varsity team, but that’s not the case in the Carmell home. Senior Trenton Carmell will be the starting quarterback for the second consecutive year as Boulder City begins its football season Aug. 29 at home against Clark. 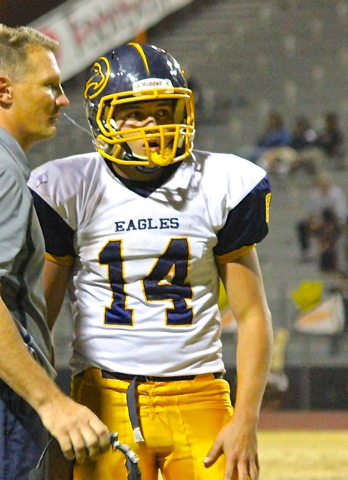 The Eagles then play Pahrump Valley Sept. 5 before opening the Sunrise League schedule a week later on the road. For now, in the fall, as Trenton Carmell works to guide the Eagles to the Division I-A playoffs, Jeanne Carmell will use her feet as one of the best soccer midfielders in the Sunrise League. Her turn at quarterback will come in the winter during the girls flag football season. Last winter, as a sophomore, Jeanne was one of the county’s most dominate passers, runners and defensive players as the Lady Eagles went 20-0 and reached the Sunrise Region championship game before a loss — two victories shy of claiming to be the state’s best girls flag football team. But currently, it’s Trenton’s turn to shine as the quarterback in the house, at least for a few more months. A year ago in 2013, the Eagles were 4-6 overall and a playoff team behind Trenton. They were 2-3 in the Sunrise League and rallied late in the season with victories to clinch the No. 4 seed in the playoffs. “There’s no question who the better quarterback is, it is obviously me,” jokes Jeanne. “Between us, it is not about who is better, really. Our competition is to prove our skills to the other by facing competition on the field. Although both sports are called football, there are differences and often comparisons can be difficult. Trenton’s football has shoulder pads, helmets and tackling. The field is 100 yards long, the schedule has nine games and there are 11 players per side. 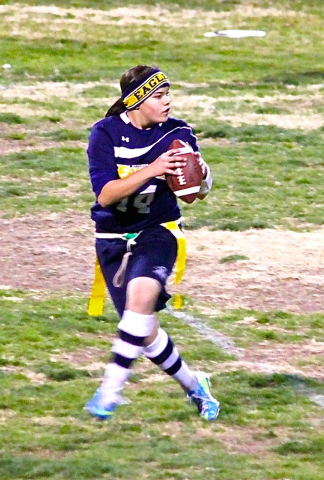 Jeanne’s football has flags tucked in her shorts, head bands and no tackling. The ball is smaller and so is the field, only 80 yards long. The schedule is 20 games and there are seven players on each side. She was selected to play in the county all-star game as a sophomore. Another commonality is that both Carmells play full time. There’s no time for rest. When they are not quarterbacking their team, each plays defense. Trenton plays cornerback. Jeanne plays all over the field, excelling at several positions, but her favorite place is at linebacker.